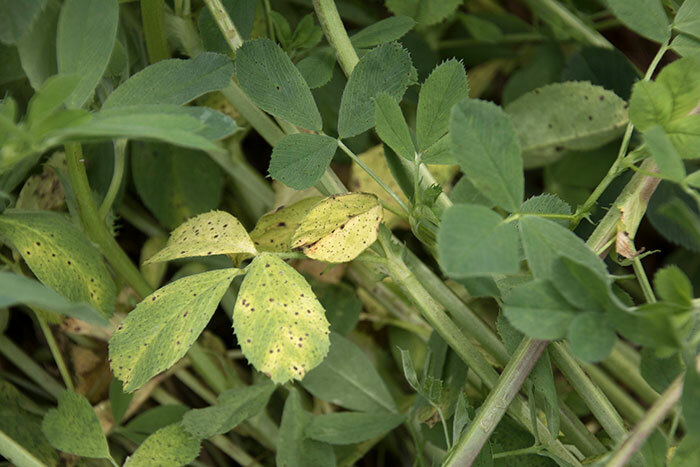 Though insect control in alfalfa production fields has always been a staple practice by top producers, most major alfalfa diseases have been kept at bay with genetic resistance. However, in the past 10 years, more growers have been using foliar fungicides for controlling leaf diseases. “Foliar diseases in alfalfa can damage leaves and sometimes stems to a certain extent,” said Damon Smith, University of Wisconsin-Madison extension plant pathologist, during a presentation at the Midwest Forage Association’s Annual Symposium at Wisconsin Dells. “This damage can lead to a possible loss in forage quality and perhaps yield, if significant defoliation occurs. Diseases might also cause plant stress,” he added. Fungicides labeled for use on alfalfa in Wisconsin include Headline, Quadris, and Priaxor. The latter product was made available for use in 2016 and provides an additional mode of action compared to the other two. All of the fungicides have a 14-day preharvest interval; this means they can only be applied one time per cutting and usually before knowing if leaf diseases will be a problem. Typical costs for the fungicide alone are $17 to $21 per acre when applied at the lowest recommended rate. However, Smith noted that generic forms of the active ingredient in Quadris are starting to hit the market at a much reduced cost. Smith initiated research several years ago looking at the impact of applying foliar fungicides on alfalfa. He began using typical dairy farm cutting intervals of 30 days or less. Overall, he found that foliar diseases don’t often appear until near cutting time for these aggressive harvest schedules and that plant defoliation was often minimal. Only occasionally did he note a slight yield benefit for applying fungicides. Smith, and others before him, had run a number of research trials using foliar fungicides between the years of 2011 and 2014. He decided to take this data and analyze it using what is called a meta-analysis. Such an analysis combines data from multiple studies and improves the ability to ascertain true treatment effects. It also allows for making future response predictions based on the results. In analyzing the data that included 52 Headline treatments and 12 Quadris treatments, the only statistically significant difference was a slight yield advantage (0.11 tons per acre) when Headline was used. However, there was always a small yield and quality advantage for using either fungicide when averaged across all of the trials. When Smith used the data to assess the probability of an economic yield response to a Headline application, he found that it was only 20 to 35 percent when the hay value was $125 to $150 per ton and application cost was $22 to $24 per acre (see figure below). For $200 per ton hay, the probability approaches 50 percent. Lowering the application cost, as a generic fungicide formulation might, would boost the probability of return. Overall, the use of a foliar fungicide with a fairly aggressive alfalfa cutting interval (less than 30 days) has offered a low probability of return in Smith’s research trials. Some alfalfa producers might have reasons for extending the cutting interval. For example, a beef producer might be less concerned about forage quality than yield. Also, a potential strategy with reduced-lignin alfalfa is to delay harvest five to 10 days and still harvest at the same quality as the shorter cutting interval. Smith has initiated several trials since 2015 comparing cutting intervals from 30 up to 40 days, using both a HarvXtra and conventional Roundup Ready variety. The initial results have showed no differential response between the two varieties; both tend to respond similarly to the fungicide treatments. Smith noted that they have typically seen significantly more leaf disease and defoliation present at 40 days than what was being found at 30 days. Similar to previous work, Smith has found no yield or quality advantage to fungicide treatments for the 30-day cutting interval. However, at 40 days, there were more instances where fungicide treatments have resulted in significant gains in yield and/or forage quality compared to the untreated check plots. Smith summarized by saying that short duration cutting intervals of 30 or fewer days generally do not warrant a fungicide treatment. Longer duration cutting intervals, beyond 35 days, will result in a higher likelihood of a positive return on investment, especially with higher hay prices and economical application costs.